Based on the Uni-Vibe used by Jimmy Hendrix. This is a favorite of guitar and keyboard players looking to add some very special vocal character to their performances. Select from sync-able speed and vibe mode and enter a whole new world of tone. Use the Selector Buttons to choose from 3 unique Vibe Modes: Sweet, Mellow and Deep. Increase the strength and stereo image of the effect by turning the Intensity and Width knobs. Use the big Speed knob in the middle to increase the rate of the effect. You can also sync the Cool-Vibe to your master tempo by flipping the Sync switch. - Speed : Changes the speed of the Cool-Vibe effect. - Intensity : Changes the intensity of the effect. - Sync : Synchronizes the speed (rate) of the Cool-Vibe to your host BPM. 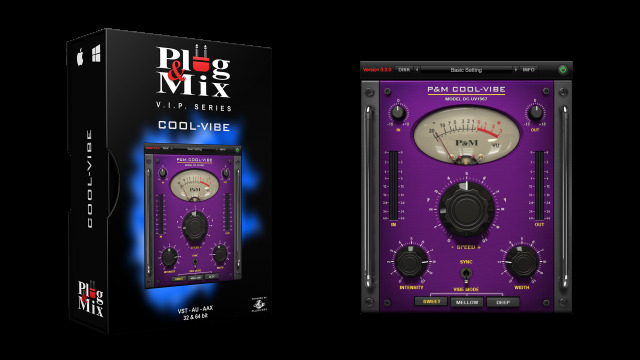 - Width : Increases the stereo width of the cool bar effect. - Selector buttons : Choose between Sweet, Mellow and Deep Vibe Modes.